Jones Mutual is a Forex CFD broker and Crypto Currency Exchange that opened in June 2018. They are owned and operated by GreenRiver OÜ, which is located at; Harju Maakond, Tallinn, Keslinna Linnaosa, Parda Tn 4, 10151, Estonia. Their main contact phone number is: +44 117 205 0663, and can be reached via email at: [email protected]. Official Website is: https://www.JonesMutual.com. The first thing you will notice when doing a review of Jones Mutual, is that they are offering investors an easy to use trading software for Forex / Crypto Currency CFD’s. It is a web based trading platform made by a company called Panda TS. We did not find the MetaTrader4 platform or mobile apps for iOS and Android. Available on the Jones Mutual’s trading software is more than 200 underlying financial assets for CFD trading, including Stocks, Forex, Commodities, Market Indexes and Crypto Currency pairs. Minimum deposit for a new trading account starts at $250. You will find that the spread on Bitcoin is as wide as $180. Everyone loses money using a trading software they found on Facebook. To get real trading signals and robots, go look at the Best Trading Software. When investors research and read reviews about new Forex brokers, they are always looking to see if their broker is licensed and regulated. Most investors in England choose to use a broker that is regulated by the FCA. When using an FCA licensed broker, your money is protected in the event of a broker going into liquidation. Jones Mutual is own by an Estonian company, and registered with MTR as “providing a virtual currency wallet service”. Their operations are based at: 10 Solunska Str., office 4, Sofia, Bulgaria. Investors who are interested in using a broker that is licensed in the United Kingdom, can find one here. Who are The Best Online Brokers Today? Look Here. ForTrade is a Forex broker licensed and authorised by FCA in United Kingdom, see here. Try a Free Demo of their custom trading platform, register here. 24option is a popular European licensed Forex broker. 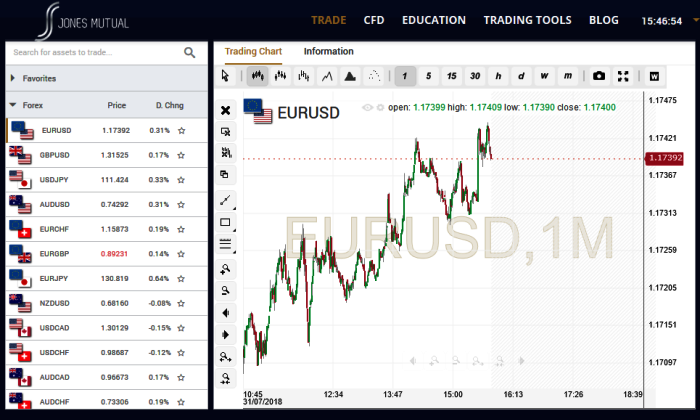 Their web based trading platform is very user friendly, see here.